HP Police Notification is out. HP Police is recruiting for 1063 Constable Govt Job Posts. 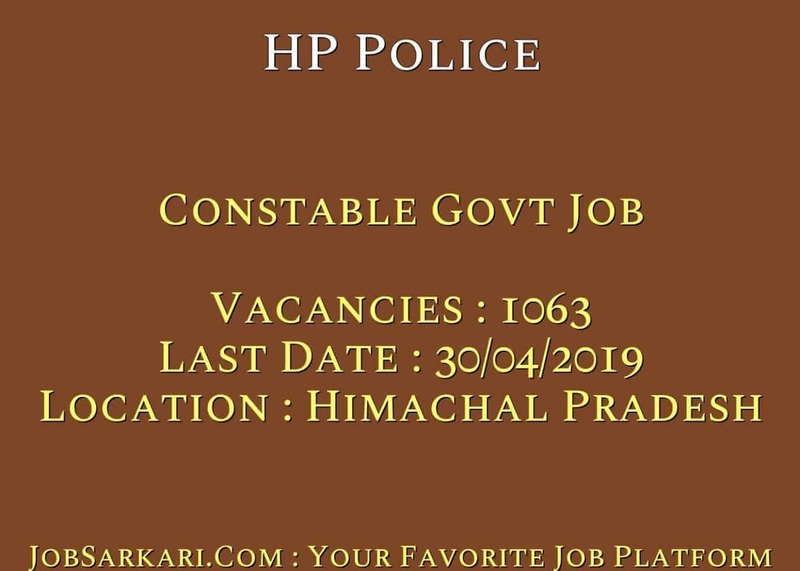 You can check HP Police - Himachal Pradesh Police last date, download HP Police notification, visit HP Police official website and check other HP Police Vacancy details.Complete Vacancy and recruitment Details about 1063 Constable Govt Job vacancies in HP Police are provided below by JobSarkari.Com only for you. Last Date of Apply Online. 30/04/2019. Last Date of Pay Examination Fee. 30/04/2019. Bilaspur 40 07 12 59. Chamba 54 10 16 80. Hamirpur 48 09 14 71. Kangra 158 29 47 234. Kinnaur 09 01 03 13. Kullu 46 08 14 68. Lahaul & Spiti 03 01 01 05. Mandi 105 19 31 155. Shimla 85 15 25 125. Sirmaur 56 10 16 82. Solan 61 11 18 90. Una 55 10 16 81. Total No. of Post 720. 130. 213. 1063. General 5' 6" 5' 2" 31"X32" Mini 18 and Max 23 Years. SC/ST 5' 4" 5' 0" 29"X30" Mini 18 and Max 25 Years. OBC 5' 6" 5' 2" 31"X32" Mini 18 and Max 25 Years. Gorkhas 5' 4" 5' 0" 29"X30" Mini 18 and Max 25 Years. Home Guards (General/OBC) 5' 6" 5' 2" 31"X32" Mini 18 and Max 28 Years. Home Guards (SC/ST) 5' 4" 5' 0" 29"X30" Mini 20 and Max 28 Years. Home Guards (Gorkhas) 5' 4" 5' 0" 29"X30" Mini 20 and Max 28 Years. Distinguished Sportsmen (General/OBC) 5' 6" 5' 2" 31"X32" Mini 18 and Max 25 Years. Distinguished Sportsmen (SC/ST) 5' 4" 5' 0" 29"X30" Mini 18 and Max 25 Years. Distinguished Sportsmen (Gorkhas) 5' 4" 5' 0" 29"X30" Mini 18 and Max 25 Years. Race for Male 1500 Meters in 06 Minutes 30 Seconds. Race for Female 800 Meters in 04 Minutes 15 Seconds. High Jump Male 1.25 Meters in Three Attempts. High Jump Female 1 Meters in Three Attempts. Broad Jump Male 4 Meters in Three Attempts. Broad Jump Female 3 Meters in Three Attempts. 4. After Registration System Will Generate Log ID And Password. 5. Candidate Need to Fill All the Mandatory Details in the Application Form. 6. Candidate Have to Upload the Scanned Copy of Documents in the Prescribed Size and Format. 8. Online Application Can be Submitted on or Before 30th April 2019. Q. What is the Last Date For HP Police Constable Govt Job Vacancy ? A. Last Date for HP Police Constable Govt Job Posts is 30/04/2019. Q. What is the Form Type of HP Police Constable Govt Job Recruitment ? A. The Form Type for HP Police Constable Govt Job Posts is Online. Q. 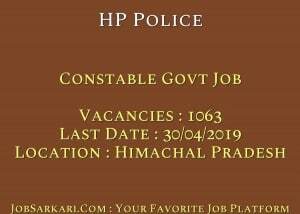 How many vacancies are available in Himachal Pradesh Police Constable Govt Job Posts ? A. There are about 1000 Vacancies in Himachal Pradesh Police Constable Govt Job Posts. Q. What is the Full Form of HP Police ? A. Full Form of HP Police is Himachal Pradesh Police .